This is really a follow up on the Joseph Cornell post Pip Starr made a couple of years ago. It is thanks to Pip that I got to learn about this artist. I made some small revisions to that post, but after viewing a key documentary, Worlds in a Box, narrated by Tony Curtis which aired on A&E, I felt there was enough new relevant information to warrant this supplemental post. Although the images here focus on Joseph Cornell’s (1903-1972) experimental films, he is best-known for his eclectic “sculptures” of collected objects arranged in boxes behind a pane of glass. Except for the 3½ years he spent at Phillips Academy Andover, he lived for most of his life in a small house in Flushing, Queens. And though he admired the French culture and collected many materials originating from that country, he never traveled there. Instead, he lived with his mother and his brother Robert, whose cerebral palsy rendered him chair-bound. This condition was a motivating force in Cornell’s artistic development. He felt a strong sense of responsibility for his brother and made ongoing efforts to keep him entertained. In one of his earliest efforts, he took one of his mother’s powder boxes, erected three needles to prop up loose thimbles, added mirrors on the inside surface and holes along the side so that one could peer through to see a “thimble forest” of infinite reflections. What distinguishes these sculptures from the more conventional is that they are not mere compilations of nostalgic objects, but almost always included moving parts that were meant to be handled by the viewer. He took great pleasure in his frequent trips to Manhattan to acquire materials from the various bookstores and thrift shops there. He only began to receive significant sums for this work after a 1949 show at the Charles Egan Gallery. Cornell’s inclusion of children was not incidental. A psychoanalysis of the man might suggest a kind of perpetual childlike wonder as he tried to imagine things from Robert’s point of view. As he got older, it was as though he longed to be an active participant in children’s activities but could never contrive an excuse to actually do so. He epitomized the Victorian sentimental view of children—observing and enjoying these precious creatures from afar. In his interaction with women assistants, artists and friends, he usually asked for pictures of them as children ostensibly for use in one of his boxes. He was more reticent when engaging with actual children though. In one instance, a little girl to whom he had lent one of his boxes, came to him announcing that she was bored with it. He promptly took it back, went into his garage and pulled out another—which by this time was quite valuable. He simply told the girl that he wished this one would be more satisfactory. His last major exhibition was a show he arranged especially for children, with the boxes displayed at child height while serving cake and soft drinks. In another effort to entertain his brother, Cornell would cheaply acquire films that had been neglected in warehouses. His earliest obsession was an obscure film, East of Borneo (1931), and when the brothers got bored with it, Cornell would reedit the film—creating whole new storylines. The lead actress, Rose Hobart, was one of his obsessions and as a result of his efforts, the short silent film named for her was produced in 1936. 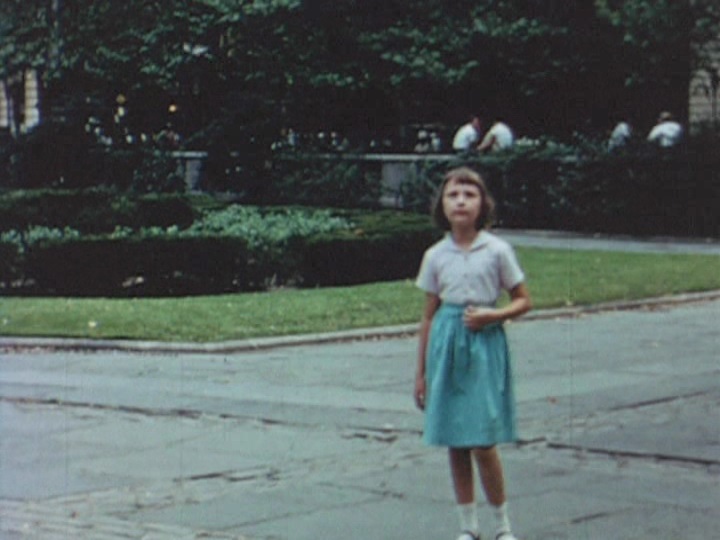 Later, he collaborated with another artist to shoot his own films in some of New York’s public spaces. Much as some people might meditate on the wonders of the universe while sitting and watching ocean waves crash on the beach, Cornell was moved by the bustle of city life—spending hours watching the comings and goings at Grand Central Station. Even seemingly mundane things fascinated him—for example, observing pigeons on the ground and in flight (The Aviary,1954 et al). Two works are of particular interest here: Children’s Party (c1938) and Nymphlight (1957). The Godiva-like scene shown in the earlier Pigtails post appears at the end of the earlier film. Although it is not possible to view all relevant material on YouTube because of copyright restrictions, a fuller collection of his work on DVD can be purchased from The Voyager Foundation. Like most artists, Cornell was highly critical of his own efforts; he seemed never to be happy with the results of his filming endeavors, except in one case. Apparently while shooting, a girl in a blue dress was caught in the frame and the cameraman was instructed to keep tracking her as she flitted about for a short time—never realizing she was being filmed. There are many scenes showing children playing or going about their daily business, but this was his favorite. The scene became integrated into the film Nymphlight which was built on the premise of a young girl rushing home in the early morning after a long night of dancing. In 1969, Cornell gave a collection of both his own films (and the works of others) to Anthology Film Archives in New York. A few years after his death, the Joseph and Robert Cornell Memorial Foundation was established, tasked with administering the copyrights of Cornell’s works and representing the interests of his heirs. This entry was posted in Cornell, Joseph, Documentary, Film, Video & TV, Realism and tagged Childhood by Ron. Bookmark the permalink. I love Cornell’s boxes – they’re so dreamable! I read his biography ‘Utopia Parkway’ long enough ago to only have scraps of memories left of it but I can remember that he was an intriguing character. There is a Russian site (you will have to register (simple) called rutracker that has 9 complete films inc. the one’s mentioned in your article available for DL via tracker.